Print vs. Internet Advertising – Who’s Your Winner? We recently conducted a survey on the 2010 Real Estate Auction Industry polling our vast client list in the biz on various topics including Advertising Allocation. Surprisingly, we discovered that print remains at the top of the list in advertising vehicles, with 45% of our respondents choosing the print route as their main source of advertising. This was followed by Internet advertising, with 30% of respondents utilizing the Web for marketing and promotion. With the onslaught of upgrades, gadgets and new venues in technology over the past 5 years alone, along with the boom of real estate auctions, it made me wonder why so many in the industry still look to print as their chief mode of advertising. I decided to take another look at the print vs. Internet debate. I’ll be honest: this is a blog, so of course I’m pro-Internet and maybe somewhat biased. Now you be honest: you can’t ignore the numbers and the bottom-line logic Internet advertising has to offer. There is a slew of Internet advertising options that reach a nationwide audience of every demographic, and some of that advertising can be free. FREE! Blogs, SEO strategies, and the gargantuan social media network offer your company and listings exposure that doesn’t have to cost you a dime. Some realtors are starting to use YouTube as well, with the videos of their listings linking back to either the agent’s own website or the company’s site. Again, no cost. Internet ad options with a price tag are plentiful and usually less expensive than print, while reaching a wider audience. Banner ads, microsites, email campaigns, pop-ups – creative, colorful and eye-grabbing, these ads demand attention and get it. And let’s not forget about mobile marketing – yet another technological advancement that’s changing the advertising landscape, and we want to not only keep up with it but capitalize on it. There are also tracking benefits to Internet marketing that you just can’t get with print. You can get tangible data on how many clicks or views you’re getting, and readjust the ad if you need to based on that information. With the economy the way it is, everyone wants and needs more for less. The Internet route of marketing seems to be offering a lot of bang for your buck. Yet some people continue to gravitate toward the printed word – it’s how things have always been done and change can be unpopular. Many home sellers automatically expect their listing to be in the newspaper since that’s how real estate has been promoted for decades. People may also be hesitant with going techno since there is the chance of glitches – a website not working properly, an email blast gone awry, etc. Many who are unfamiliar with the Web are less likely to trust their advertising dollars with it. Older sellers are particularly resistant to online advertising, viewing print as more reliable and ‘safe’. In turn, buyers who find real estate through newspaper ads are usually over 35 years old. Still, the tide does seem to be turning: Mediabuyerplanner.com reports that “Home buyers in the U.S. are twice as likely to use online sources than print sources to find information about open houses they are interested in, according to a survey commissioned by Trulia and conducted by Harris Interactive.” This particular study was conducted in 2009 – I think it’s safe to say the numbers on the Internet side have most likely gone up. Again, I realize that I’m not exactly objective. But the unparalleled variety, limitless audience and ease on the marketing budget make the Internet the place I’m going to go to with my promotional aspirations and I’m going to encourage all my clients and colleagues to do the same. I’ll always love the printed word, but when it comes to smart business, my marketing/advertising heart beats for the World Wide Web. What’s in Store for Summer? Signs of summer are fast approaching – no more snow, warmer temperatures, flowers in bloom… A lovely time of year for most, yet always a question for real estate professionals. Summer is renowned as the ‘vacation season’ where even thriving companies tend to slow down. Real estate is notoriously sluggish during the summer months, but with the consistently high number of foreclosures flooding the market, could this be a potentially lucrative season for real estate auctions? 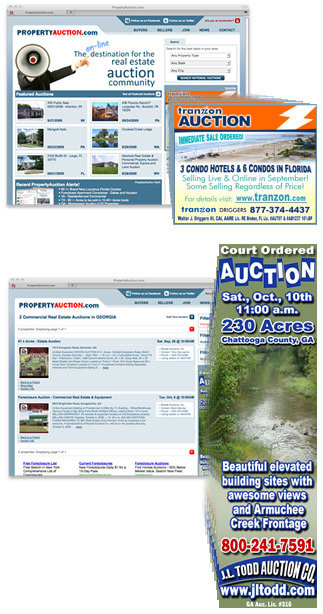 According to last year’s data, PropertyAuction.com had a plethora of listings in summer 2010. 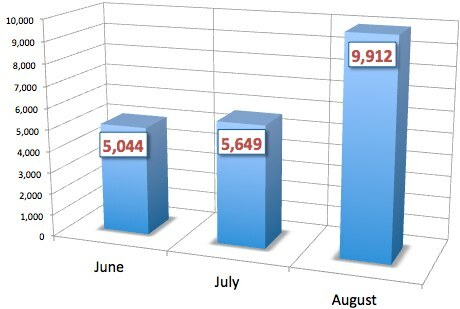 The month of June saw 5,044 listings of both commercial and residential auctions combined, July came in at 5,649 total auctions, and August proved to be a very busy month with a total of 9,912 auctions listed. None of the summer months were at the bottom of the inventory list – the lowest amount of auction listings were in January, February and April, respectively. It’s a well-known fact that the increasing foreclosure rate continues to depress the housing market. After last year’s robo-signing scandal, the foreclosures held back in 2010 are making a reappearance, which places a great burden on traditional sales. Msnbc.com reports, “Foreclosures are expected to remain elevated through the year as homeowners contend with stubbornly high unemployment, tougher credit standards for refinancing and falling home values…The decline will push more borrowers underwater on their mortgages. Already, about one in five homeowners with a mortgage owe more than their home is worth.” Some could speculate that this can possibly trigger a substantial inventory of real estate auctions. This proves to be true: Farmers National Company is already posting their June land auctions in Nebraska, Missouri and Iowa. On upper-tier listings, luxury property auction companies such as Grand Estates Auction Company, J.P. King, and Premiere Estates Auction Company each have several key properties slated for June. In short, the summer season can still be a tough read for the real estate auction business even at mid-Spring, but as of now industry professionals are planning on keeping pretty busy. PA Picks – In the Market for Some Office Space? PA Picks – The Best Way to Ring in the New Year? Beachfront Property! PA Picks – How About Some Hospitality?